It was originally announced that the five-year £125m funding of the Financial Inclusion Fund (FIF) would not be renewed when it runs out in March. The move was likely to lead to up to 500 debt advisers losing their jobs, so the additional £27m is a rare piece of good news. However, it’s only for one year and is dwarfed by the overall reduction in debt advice funding following cuts in council grants. The threatened closure of Citizens Advice branches as a result of swingeing cuts in its budget can only have a negative effect on those struggling with debts. And all this is happening as the number of people becoming insolvent continues to rise. In England and Wales alone, over 135,000 people went bust last year, opting either for bankruptcy, an Individual Voluntary Arrangement (IVA) or Debt Relief Order (DRO). The last thing these people need is to fall into the hands of debt management companies, many of which have been exposed by the Office of Fair Trading as providing an over-priced and shoddy service to their clients. And yet I can’t help but fear that budget cuts will lead some struggling consumers into these companies’ clutches, with glossy adverts failing to mention their high charges. And – in far too many cases – dodgy sales practices and poor advice. Hard-pressed families deserve better. 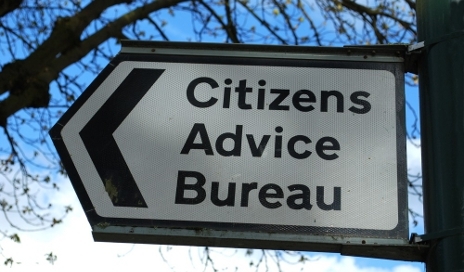 For a start, despite the doom and gloom, Citizens Advice isn’t shutting down. While some services may be cut, the organisation will continue to provide much-needed debt advice. And let’s remember the many committed volunteers who keep local Citizens Advice bureaux going. People like Zhenya Golomuz, who is running the Virgin London Marathon to raise funds to keep the Blackpool CAB open. The Consumer Credit Counselling Service (CCCS), National Debtline and PayPlan also offer free and impartial debt help, either by phone, online or through regional advice centres. The debt management industry preys on the desperation of its customers. Luckily there is still an alternative – the free-to-consumer impartial advice sector. It must be supported. I agree and share your concern that any uncertainty about continued public funding for free debt advice will lead many struggling debtors to seek help from fee-charging debt advice organisations. The recent Office of Fair Trading review found the fee-charging sector which to be unfit for purpose so the challenge now is for debt charities to work together to provide free debt advice, face-to-face, over the phone and online, for those who need it. Given CCCS’s capacity on its helpline and online debt counselling, there is no need for anyone to pay for debt advice. It is always so sad when people fall into debt through no fault of their own – as it appears is happening to many at the moment. Perhaps a requirement should be placed on the banks to donate to, and/or subsidise, the likes of CAB, CCCS and Pay Plan? After all, it is generally bank customers who are being hounded and in desperate need of advice; they are also the one’s who can least afford to be ‘scammed’ by extortionate debt management fees. As a past advisor in a local CAB I can testify to the excellent work that they do, particularly on debt advise. It always seemed to be difficult to obtain funding for this work and so it is good to hear that funding is now to be found, but it should be assured for much longer than one year. These organisations require more encouragement rather than living a day to day existence. Also the lenders should not encourage consumers to get so deeply into debt. Given the unavoidable need for government spending cuts, and the consequential inevitable increase in people in need of debt management advice, a caring government would INCREASE funding support for debt advice…. …and even a government that doesn’t care about people but does care about minimising demands on the welfare state should INCREASE funding support for debt advice, because those who cannot cope with their debts are more likely to become ill and make demands on NHS services, and more likely to need the help of Social Services, so it will be more cost effective to help people mange their debts than to ignore them. There is no doubt that the increase in commercial ‘debt advice’ companies is a concern, and should be a concern to all. Looking at the latest poll on this page regarding the qualification of IFA’s, why should this not also apply to the debt advice industry? This would ensure that debt advice could only be provided by appropriate organisations with advisers qualified to a national standard in debt advice. Thanks everyone for your comments – sounds like we’re all singing from the same hymnsheet: Debt advice really is needed more than ever at the moment and budget cuts to advice services will only store up problems for the future, because (i) some people struggling with debt might not seek/get free advice and (ii) because some commercial debt management companies will sell them inappropriate debt solutions and all will charge over the odds for the privilege.